I am so sorry! I just could not resist the lyrics of that song. 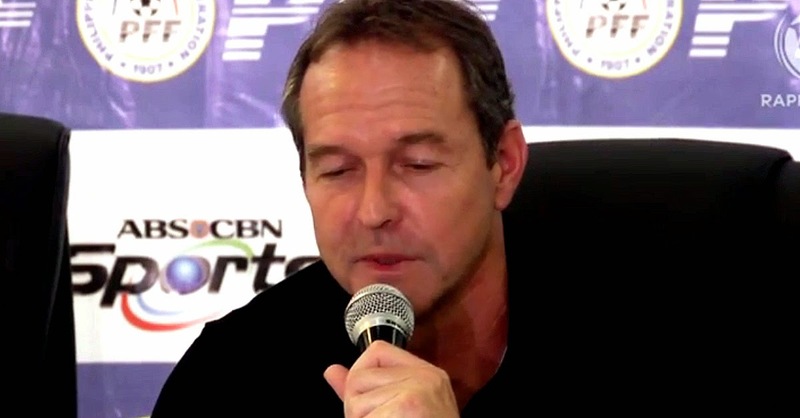 The current hot issue hogging the attention of the Filipino football community has all the hallmarks of a family spat. On the one hand, a small group of European-based players feeling aggrieved after having been omitted from the Philippine Peace Cup squad and turning to social media to air their gripes. On the other hand, a coach who finally got to explain his side via a press conference held yesterday, a video of which is conveniently available over the Internet. Not quite the tiresome Gretchen-Claudine saga but more like a quarrel between a father and his sons and a lot of hurt feelings. “He will never play for me again,” Thomas Dooley vowed. Somehow, that statement never quite carries a ring of finality to it when in a football context. Even as Dooley, Philippine national team coach, uttered the statement in reply to a query about one Stephan Schröck, I was reasonably certain that he – ditto Dennis Cagara and Neil Etheridge – on the contrary will play for him again. Everyone is just understandably emotional at the moment; but as I used to tell the boys who played in my teams before, it was never when I was angry that I was at my most dangerous. Instead, it was when I did not care. That Dooley is angry is, therefore, a good thing. Everything will begin to cool down after a while; but we will all have to see whose pride chicken will come down from its perch. “They should have called me,” Dooley said; and I did point out in my previous article on the issue that seeking a private conference would have been the more appropriate course of action for the players in question. However, I was in management – and not just of football teams – for decades, and if there is one thing that I can state for a fact about organisations, it is that trouble always brews from a) the absence of logical procedures and b) muddled communication lines. While Dooley has every right to feel affronted, I do wonder out loud if a protocol for calling up or dropping players has been established. I understand from one article I read years back that England players get phone calls and printed invitations from the Football Association if they are to be called up to the national team; but that often the players get a whiff of the call up from the media long before official communications from the FA are made. What I do not know is if things are done the same way for players who are omitted. Given the number of players available to England and how they are spread all over the vast expanse of the country, I will not be surprised if they are left to find out if they are dropped from the media. Not that there ought to be anything wrong with this. Being selected or dropped is part and parcel of a professional football player’s life even at club level; and it never helps a player to whine about the second. A call from the gaffer will be nice; but there will always be future opportunities to play again, especially for younger players. Things are different in the Philippine setup, of course. The pool of players is substantially smaller; and many of the Europe-based players at one time had to be coaxed into joining up. It was a good thing for Dooley to come in when he did with a fresh eye and credentials more impressive than any of the players. It does a world of good for the team – and the players, including the three in question whatever they think or say – that he arrived with a clear vision, a system and a performance-based selection policy. It does not harm Schröck, Cagara and Etheridge to be shown that they will be treated just like everyone else; in other words, never as though they are bigger than the team. Each of them will win more respect and admiration if they are prepared to fight for their places rather than whine publicly. After all, fighting for places is something they do day in and day out in their respective clubs. After all is said and done, each still has plenty to contribute. It will be a case of cutting off one’s nose just to spite if they are not called up again. In truth, it will be years into the future before we get the glut of quality players that mature football countries already enjoy. It is still best for the country that they are; and Dooley is too smart not to know this. So gentlemen, call him maybe? Acknowledgment: Top photo captured from a YouTube video of yesterday's press conference.